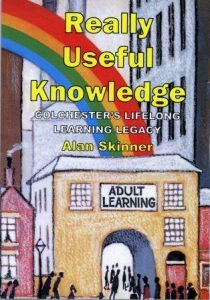 OUR LATEST BOOK: “Really Useful Knowledge” A social history of the community that can truly be termed a “Learning Town” from Georgian times to the present day • Produced for the 2018 Colchester Festival of Lifelong Learning • Available now for only £6.50 from Red Lion Books, High Street or for mail order see below. * TO ORDER: send either (a) cheque payable to “Learning Never Stops” or (b) proof you have made a payment to our LEARNING NEVER STOPS HSBC account sort code 40-18-04 account 51725289 to: Access Books, Willow Cottage, Staffords Corner, Gt Wigborough, Colchester CO5 7RP (be sure to include full contact details) and you’ll get it by return post. Policy paper on adult learning Published at a time of great change for both national and local adult education, this paper sets out the Charity’s suggested strategy for providers to ensure that learning opportunities for adults continue to serve whole communities and not just those who can easily access and afford them. This publication can be downloaded free via the Resources section of this website – click on the top menu. * TO ORDER: send (a) your cheque payable to “Learning Never Stops” or (b) proof you have made a payment to our LEARNING NEVER STOPS HSBC account sort code 40-18-04 account 51725289 to: Access Books, Willow Cottage, Staffords Corner, Great Wigborough, Colchester CO5 7RP (being sure to include full contact details) and you’ll get it by return post.